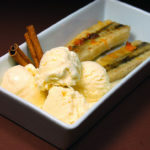 Cinnamon Ice Cream recipe served with Baked Bananas for the ultimate dessert! This was my favorite dish of my party. Probably because I’m a dessert girl, and I love baked bananas! 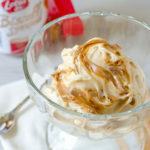 However, this cinnamon ice cream surprised me on how creamy and delectable it turned out to be! Paired with the baked bananas, it was a fantastic treat and I wished it wasn’t just a tapas sized portion. My plate was empty in seconds. Next time, I’ll bring on the huge bowl! 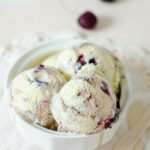 You’ll be astonished at how easy this ice cream is to make, as long as you have an ice cream machine. I have this fairly inexpensive one and use it all the time. 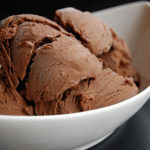 If you love ice cream, I highly recommend you get your own ice cream maker, and pick up a copy of David Lebovitz’ book “The Perfect Scoop”, as his ice cream recipes seem to rise above the rest. I’ve also got my eyes on this gelato book, which can also be made in your ice cream maker! Make the ice cream a day ahead to let the cinnamon flavor blend in. 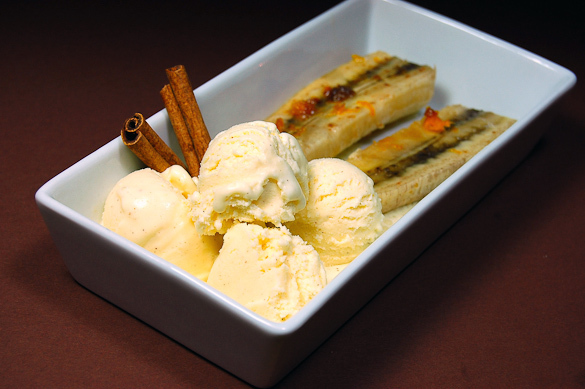 Serve immediately on the warm bananas, but also eat it immediately or you’ll be drinking your ice cream! Warm the milk, sugar, salt, cinnamon sticks and 1 cup of the cream in a medium saucepan. Once warm, cover, remove from the heat, and let steep at room temperature for 1 hour. Rewarm the cinnamon-infused milk mixture. Remove the cinnamon sticks with a slotted spoon and discard them or save them for garnish and presentation. Pour the remaining 1 cup cream into a large bowl and set a mesh strainer on top. Stir the mixture constanly over medium heat with a heatproof spatula, scraping the bottom as you stir, until the mixture thickens and coats the spatula. Pour the custard through the strainer and into the cream. Stir until cool over an ice bath. Preheat oven to 400˚F. Spray a baking pan with nonstick cooking spray. Peel the bananas and cut horizontally in half, then again vertically in half, so there are four pieces per banana. Place the bananas in the baking pan in a single layer, cut side up. Pour the juice evenly over the bananas, then sprinkle on the zest and brown sugar. Dot on the butter and bake for 10 to 15 minutes. 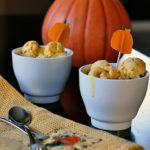 Serve with a scoop of Cinnamon Ice Cream. I made a cinnamon ice cream recipe and woh, was it strong! It was very spicy. I’ll have to give this one a try. We love desserts that include bananas and roasted bananas are a fave with my children. If I only have one or two bananas I dry saute them in a pan on the stove then sprinkle them with a tiny bit of cinnamon sugar just before taking them out. The kids gobble it up. Mmmm….delicious! I can eat that for breakfast even. YUM. I’ve never had cinnamon ice cream or baked bananas. When I buy an ice cream maker, I’ll give this a go. Sounds amazing, great photo too!